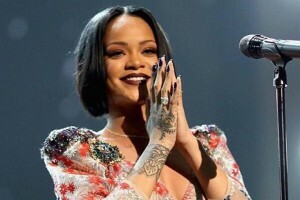 CALIFORNIA – Barbados’ pop princess Rihanna is continuing her reign, adding more jewels to her crown following the staging of the 2017 iHeartRadio Music Awards in Inglewood, California, on Sunday. The 29-year-old star picked up the R&B Song of the Year gong for ‘Work’, which beat out ‘Needed Me’, another of her nominated hits, as well as Bryson Tiller’s ‘Exchange’, Usher’s ‘No Limit’, and Beyonce’s ‘Sorry’. ‘Work’ also worked its magic for Rihanna and Drake in the socially voted category Best Collaboration, beating out Jamaican artist Sean Paul’s collaboration with Sia on ‘Cheap Thrills’. Also proving to be no match for ‘Work’ was Rihanna’s spot with Calvin Harris on the Taylor Swift-penned ‘This Is What You Came For’; as well as the Chainsmokers’ two big hits ‘Don’t Let Me Down’ with Daya, and ‘Closer’ featuring Halsey. Because she was in France to showcase the Fenty x Puma Fall/Winter 2017/2018 collection at Paris Fashion Week, Rihanna was unable to attend the show but she recorded a message which was shared via iHeart’s Snapchat. RiRi nevertheless failed to nail the R&B Artist of the Year award, with that honour going to The Weeknd. And while both ‘Work’ and ‘This Is What You Came For’ were expected to do well in the Best Music Video category, that honour went to Zayn’s ‘Pillowtalk’. Ariana Grande’s ‘Side to Side’, featuring Trinidad-born star Nicki Minaj, also lost out to ‘Pillowtalk’. Both Rihanna and Drake (Too Good) and Sia and Sean Paul (Cheap Thrills) proved to be no match for Justin Bieber’s ‘Love Yourself’ in the socially voted category Best Lyrics. Rihanna also had to take a back seat in the Female Artist of the Year category, with Adele continuing her winning ways in this year’s awards season. Justin Timberlake won Song of the Year for his Trolls theme song, ‘Can’t Stop the Feeling!’. Other big wins included Justin Bieber for Best Male Artist of the Year, The Chainsmokers for Best New Artist, Thomas Rhett for Country Artist of the Year, and Bruno Mars, who received the coveted Innovator Award.